The humanitarian movement against Leopold’s violent colonisation of the Congo emerged out of Europe, but it depended at every turn on African input. Individuals and groups from throughout the upper Congo River basin undertook journeys of daring and self-sacrifice to provide evidence of atrocities for the colonial authorities, missionaries, and international investigators. Combining archive research with attention to recent debates on the relation between imperialism and humanitarianism, on trauma, witnessing and postcolonial studies, and on the recovery of colonial archives, this book examines the conditions in which colonised peoples were able to speak about their subjection, and those in which attempts at testimony were thwarted. 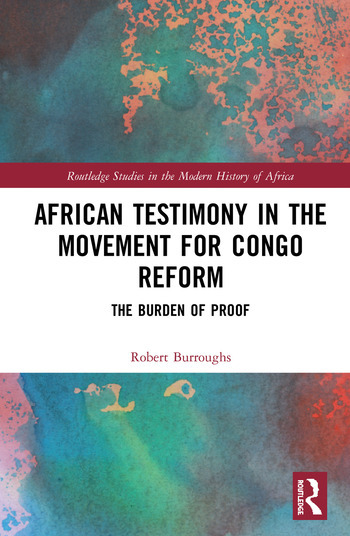 Robert Burroughs makes a major intervention by identifying African agency and input as a key factor in the Congo atrocities debate. This is an important and unique book in African history, imperial and colonial history, and humanitarian history. Robert Burroughs is a Senior Lecturer in the School of Cultural Studies and Humanities, Leeds Beckett University, UK.